Ciaron Harkin is welcomed to Coleraine by Lyndon Kane and Brad Lyons. New signing Ciaron Harkin is determined to take his chance when it comes along. The 20-year-old, who joined the Bannsiders on Sunday, knows he will have to wait for his opportunity to come along, but he is determined to grasp it with both hands when it does. “When I first spoke to Oran (Kearney), Coleraine were on a poor run but that’s now all changed,” he told Times Sport. 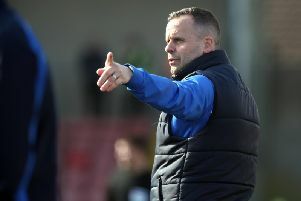 “They had great win at Windsor against Linfield and they won in the cup against Carrick, so I’m going into a winning side and like any team you have to earn your right to get in. Harkin, who captained ‘Stute, said he felt the time was right to make the move. “I think it’s the right time to do it and it just felt right. Anyone I asked, all advised me to just go for it,” he admitted. “Everybody at Stute were brilliant to me, they all treated me well, the fans, committee, everyone were great to me. “It was a great club to be at and the time I was there I enjoyed every minute of it and I appreciated everything they have done for me. “I wish Stute all the best and really do hope they get promoted this year; all the lads are my friends, so it would be great to see them next season in the Premiership,” he said. Boss Kearney is delighted to have landed the highly-rated central midfielder. “We do our homework on him like we do with all players, and every report has been really positive so we are delighted to have him on board,” he said. “It’s well documented we have a lot of young players at the club of his age and quality who have played a big part in our season and I would expect him to do the same. “Young players bring a vibrant attitude to it and a huge amount of energy and that’s something which has been a huge part of our success this season. “Ciaron is a fit lad, he gets about the pitch well and he will add to that. “He wass captain of Institute which says a huge amount at the tender age of 20. “I went especially to the play-off game away at Ballinamallard in May, and he was as good a player as there was on the pitch that night.